Aberdeen Group research shows that CMOs are increasingly adding science to the art of marketing, with marketers being goaled and measured based on revenue-oriented metrics (company revenue growth, contribution to sales-pipeline) over activity-oriented metrics (leads, traffic, awareness). Adoption of marketing automation technology has given Marketing the efficiency and measurability needed to track and deliver on these goals. And as companies enter their second, third and fourth years (or more) of marketing automation adoption, they begin to gain data to support more sophisticated, behavior-based segmentation, providing finer control and predictability to marketing operations—the ability to truly run marketing as a P&L-oriented business. 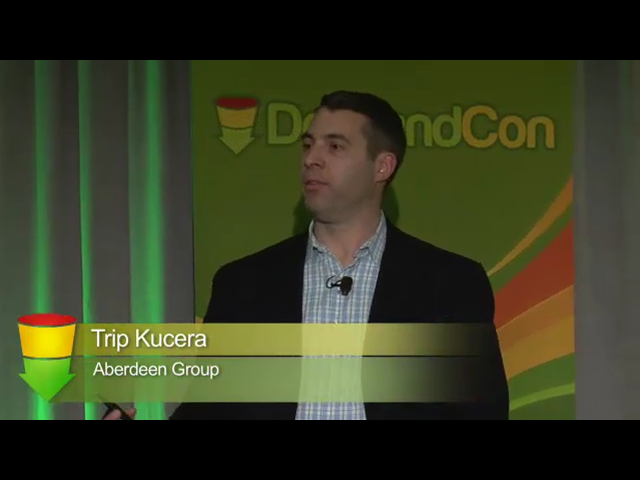 In this keynote, Trip Kucera, Sr. Research Analyst for Marketing Effectiveness & Strategy at the Aberdeen Group, will present the latest trends and insight on data-driven demand generation from Aberdeen’s research. In addition to looking at the impact and use of metrics in managing marketing operations, Trip will explore the challenges and opportunities presented by social media, which threatens to upset the demand generation apple cart, as well as the potential for social CRM to address emerging requirements.